Howard University on the Chess Map! "Howard University Chess Club participates in first rated Chess Tournament," The Washington Informer (Vol. 39 No. 9), 12-19 December 2002 (Washington, DC, USA). Three members from the Howard University Chess Team played in the annual National Chess Congress 2-day tournament in Philadelphia's Adams Mark hotel. There were about eight sections in the tournament starting from master level of 2400 down to beginner level of 1000. Ali Torain played in the under-1600 section and won 3 out of 6 games. Emmanuel London won 3 out of 6 games in the under-1400 section. Travis Hoskins, new newest member of the team, made history by winning all six of his games in the unrated section, 6 out of 6; grabbing the championship and bringing the first place trophy back to Howard. After a weekend of intense play, the Howard University Chess Team traveled home safe. Vaughn Bennett, Executive Direction of the Olympic Chess House, chaperoned and coached the chess team to the tournament. It was a historical event as the chess team was able to meet and play with over 600 players from all over the United States and world. Maurice Ashley, the first black Grandmaster was in attendance as he won 4 out of six games. The Howard University Chess Team did well overall. 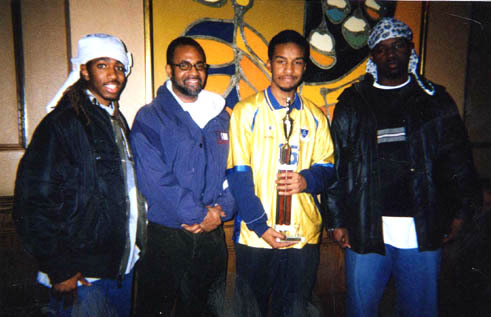 L-R: Ali Torain, Captain of the Howard University Chess Team; Vaughn Bennett, Executive Director of Olympic Chess House and division section of National Chess Congress; Travis Hoskins, winner of unrated section; Emmanuel London, Co-Captain of Howard University Chess Team.